Hi! Before my prototypes become rotten on my hard drive, I decided to release them as Open Source so you can at least benefit a little bit from them. Additionally, I also include my two previously commercial plugins TimeHide and SafeFrame in this collection. Note that the state that these plugins are varies a lot. Of course, AutoConnect, TimeHide and SafeFrame work as well as they used to. The 6-years-promised Pr1mitives also work quite well. Others like the XPress Effector, Dependency Manager or Procedural are quickly put-together prototypes that may still prove to be useful. Then stuff like TeaPresso may never become very useful, but I suppose its a fun gimmick. All previous customers of TimeHide and SafeFrame should also get their R20 version here. I am afraid the documentation is a bit lacking. But I hope you can have some fun playing around with these plugins! Thank you for these tools. That’s very generous of you. Thanks a lot! But how to install TimeHide? 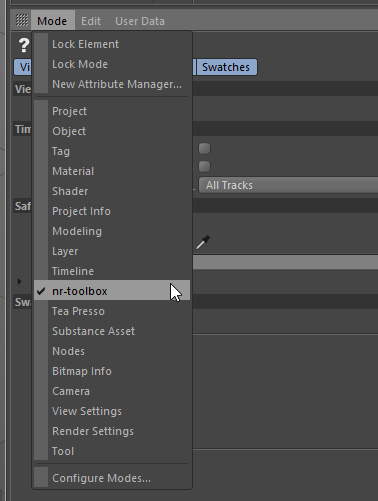 @DrBluem After installing the nr-toolbox plugin, you now find the TimeHide settings in the “nr-toolbox” project settings instead of the document settings. and do you have an example for the Smear Deformer? Help says it’s for animation, but nothing happens. @DrBluem You are searching in the wrong place. Chek the Attribute Manager’s “Mode” menu. For the Smear Deformer, you have to animate the object to see its effect. Also remember its a deformer so you need to place it as a child object of the object you animate. The faster the object moves the more you can see the effect of the Smear Deformer. If you enable the “Interactive” checkbox you can also just move the object around in the Viewport without animating it to see its effect. @NiklasR Hi, it not showed up in the plugins menu! I’m on mac pro and El Capitan! I’ve tried to place under both plugins folder, but nothing happens! Maybe have I done something wrong? I’ve put up an OSX build that should work with El Capitan (the archive ends with mac10_11 instead of just mac).